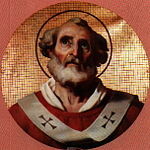 Pope Saint Silverius was pope from June 8, 536, to March 537. His reign was remarkable because, after being caught in the struggle between the Byzantine Empire and the "barbarian" kings who then ruled Italy, he was deposed for treason and ultimately exiled by his successor, Pope Vigilius, where he died in prison. Silverius lived during the later stages of the Monophysite controversy over the question of whether Christ had one "nature" (divine/human) or two (divine and human). He was the son of a previous pope, Hormisdas, having been born before his father became a Roman deacon. Two accounts of his reign in the Liber Pontificalis take opposing views of him. The first characterizes him as having been irregularly appointed not by the clergy but by the Ostrogothic king Theodahad, whom he had bribed. The second portrays him as the victim of the intrigues of the Byzantine empress Theodora, who arranged for him to be ousted because he opposed Monophysitism. In the latter account, Silverius refused to restore Anthimus, the Monophysite Patriarch of Constantinople, and consequently Theodora had Silverius deposed on charges of treason for helping the Ostrogoths, who were besieging the city. Silverius was replaced as pope by Vigilius, who had been a papal legate to Constantinople. Stripped of his episcopal dignity and degraded to the rank of a simple monk, Silverius was banished from Rome to the Anatolian city of Lycia, in modern Turkey. Emperor Justinian I, after receiving his appeal, then sent Silverius back to Rome for an inquiry. Vigilius, however, intercepted him before he reached Rome and sent him to a prison island near Naples, where he soon died from his poor treatment there. In effect martyred by his fellow pope, he became a saint in the Roman Catholic faith, and his feast day is celebrated on June 20. The most prominent features of the religious situation of the Roman church during the time of Silverius were the Monophysite controversy and the struggle between Rome and Constantinople for primacy among the Christian churches. Monophysitism taught that Christ had only one "nature," in which his divinity and humanity were combined. The "orthodox" position, on the other hand, was that Christ had two harmonized natures, one divine and one human. The Council of Chalcedon had settled the matter in favor of the orthodox view, but Monophysitism was still strong in many locations, particular in the East. In the midst of this controversy, the churches of Rome and Constantinople vied for supremacy, with Constantinople believing it should receive special honor because it—and not "old" Rome—was the capital of the empire. The Roman church, on the other hand, insisted that, as the church of Saint Peter, it alone held the final authority in matters of theology. It often found itself at odds with Constantinople on matters of church disciple as well. Meanwhile, several attempts by the eastern emperors to heal theological divisions in the empire by tampering with theology had proven futile, in large part due to Rome's uncompromisingly "orthodox" policy, while the patriarchs at Constantinople had sometimes wavered theologically under imperial influence. Rome saw itself as an independent bulwark against this "caesaropapism." The sad story of Silverius and Vigilius represents a low point in papal independence. Ironically, it would be the rise the Franks in the West and of Islam in the East that would help put the papacy again on a strong independent footing in its relations with Constantinople. Silverius's birthdate is not known, but his pedigree could hardly have been higher. He came from a wealthy and noble Roman family and was the son of Pope Hormisdas, who had been married before becoming one of the higher clergy. Silverius entered the service of the Roman church, no doubt at an early age and with his father's support. He must have witnessed his father's support, while still a deacon, of Pope Symmachus' trials under the reign of anti-pope Laurnetius, as well as Hormisdas' own long and difficult battles with Constantinople during the Acacian schism, which were ultimately resolved during Hormisdas' papacy. However, the split between the Roman and eastern churches had only been healed as a result of the ascendancy of an anti-Monophyiste emperor in the East, namely Justin I. 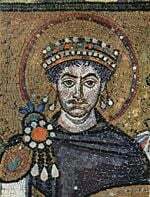 Now, Justinian I (the Great) had become emperor, and he pursued a less aggressive policy against Monophysitism. His wife, Theodora, was allegedly a secret Monophysite herself. Even if this were only a rumor, it was clear that Justinian's policy aimed at reconciling the remnant of the Monophysites, especially in Egypt (Alexandria) and Syria (Antioch), with the main body of the eastern church. To make matters worse, Justinian had appointed as patriarch of Constantinople an apparently orthodox bishop, Anthimus, who was later revealed to have Monophysite sympathies and was deposed by Pope Agapetus. The Empress Theodora was rumored to be sheltering the alleged heretic and seeking his restoration. Meanwhile, the Goths remained in power in the west. Even though most of the Gothic kings were Arian Christians, and thus heretics, they generally interfered little in church affairs, and the papacy succeeded for the most part in maintaining an independent stance. Such was apparently not the case with Silverius, as the stage had been set for a classic case of "Byzantine intrigue" in which he would find himself in the middle of a tug-of-war between East and West. Justinian I reconquered Italy from the Goths and sought an accommodation with the Monophysites in the East. Silverius was subdeacon at Rome when Pope Agapetus died at Constantinople on April 22, 536. Empress Theodora, and perhaps Justinian I himself, had hoped for the election the Roman deacon Vigilius, who was then at Constantinople as a papal envoy. Vigilius must have seemed more understanding than most other Roman clergy of the need to bring the remnants of the Monophysites back into the fold. However, Theodahad (Theodatus), King of the Ostrogoths, did not want a pope so closely connected with Constantinople. He thus forestalled her, and caused the subdeacon Silverius to be chosen. The election of a subdeacon as bishop of Rome was highly unusual, and the author of the first part of the life of Silverius in the Liber Pontificalis characterizes it as the result of Theodahad being bribed by Silverius and his supporters, and accepted by the clergy only "by force of fear" that they would "suffer the sword" if they did not vote for him. After Silverius had been consecrated bishop (probably on June 8, 536) all the Roman presbyters thus gave their consent in writing to his elevation. The author of the second part of Silverius' life in the Liber Pontificalis, in complete contrast to the first part, is favorably inclined to the pope, and hostile not to the Ostrogroths, but to the Byzantine court. According to this source, after Silverius had become pope, Theodora sought to influence him to soften the papacy's stand against Monophysitism. She desired especially to have him enter into communion with the Monophysite Anthimus of Constantinople, who had been excommunicated and deposed by Agapetus along with Patriarch Severus of Antioch. However, the pope committed himself to nothing, and Theodora now resolved to overthrow him and to gain the papal see for Vigilius. 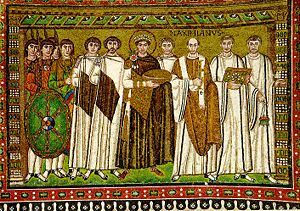 Justinian with clerics (right) and soldiers (left). Belisarius may be the bearded figure on Justinian's right in this mosaic that celebrates the reconquest of Italy under Belisarius. Meanwhile, troubled times befell Rome during the struggle that broke out in Italy between the Ostrogoths and the Byzantines after the death of the daughter of Theodoric the Great, Queen Amalasuntha. In December, 536, the Byzantine general Belisarius garrisoned in Rome, and was received by the pope in a friendly and courteous manner. The Ostrogothic king Vitiges, who had ascended the throne in August, 536, then besieged the city. In the midst of all this, Antonina, the wife of Belisarius, allegedly influenced her husband to act as Theodora desired. The pope was accused of a treasonable agreement with Vitiges. A much disputed letter revealed that Silverius had offered the king to leave one of the city gates secretly open so as to permit the Goths to enter. Silverius was consequently arrested in March, 537, stripped of his episcopal dignity, given the clothing of a monk, and carried off to exile in the East. Vigilius was then duly consecrated bishop of Rome in his stead. Silverius was taken to Lycia, in Anatolia, where he was later sent to reside at Patara. There, the bishop of Patara soon became convinced that the deposed former pope was innocent. He journeyed to Constantinople and was able to lay before Emperor Justinian various evidences of Silverius' innocence, including an allegation that a letter proving Silverius' conspiracy with the Goths was forged. The emperor then wrote to Belisarius commanding a new investigation of the matter. He instructed that, should it turn out that the letter in question was forged, Silverius should be returned to the papacy. At the same time, the emperor allowed Silverius to return to Italy, and the former pope soon entered the country, apparently at Naples. However, Vigilius arranged to take charge of his deposed predecessor before the new investigation could proceed. In this he allegedly acted in agreement with Empress Theodora, and was aided by Antonina. Silverius was taken to the Island of Palmaria in the Tyrrhenian Sea and kept there in close confinement. There, he died in consequence of the harsh treatment he endured. The year of his death is unknown, but he probably did not live long after reaching Palmaria. He was buried on the island, according to the testimony of the "Liber Pontificalis" on June 20, and his remains were never returned to Rome. Silverius was reportedly invoked as a martyr after his death by the believers who visited his grave. Only in later times, however, was he venerated as a saint. The earliest evidence of his sainthood is a list of saints of the eleventh century. The Martyrologium of Peter de Natalibus in of the fourteenth century also contains his feast, which is celebrated on June 20. According to Ponza Islands legend, fishermen were in a small boat in a storm off Palmarola and they called on Saint Silverius for help. An apparition of Siverius called them to Palmarola where they survived. Historically, Silverius' successor and later his persecutor, Pope Vigilius, proved to be an unwilling tool of Byzantine policy. During the Three Chapters controversy, he at first resisted Justinian's policy but was taken by force to Constantinople, where he was held for eight years until he agreed to endorse the Second Council of Chalcedon as Justinian wished. While we will never know how Silverius' reign as pope might have turned out if he had remained in office, the reign of Vigilius is considered one of the papacy's low points. ↑ The major role of the wives of Justinian I and Belisarius in this drama may be taken with a grain of salt. For the two women, together with the new pope, to countermand the emperor's order for a new investigation is plausible, but would have been an extremely dangerous act on their behalf. On the other hand, a later writer blaming these women for the failings of powerful men—whether the emperor, the general, or the pope—would only be natural. This page was last modified on 22 May 2015, at 19:54.